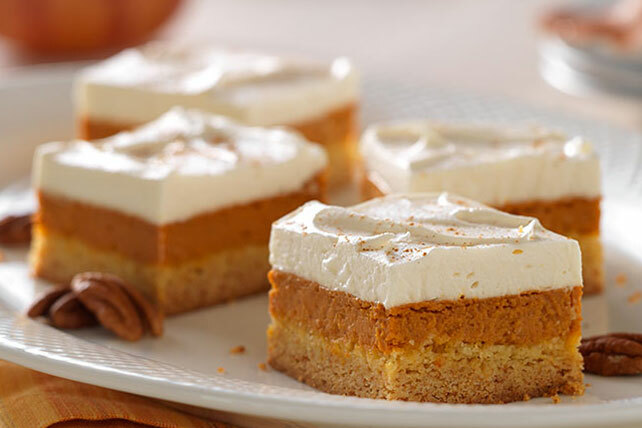 Give 'em layer upon layer of yumminess—from a buttery cake crust to a luscious pumpkin pie filling to a sweet and creamy maple-whipped topping. Line 13x9-inch pan with Reynolds Wrap® Aluminum Foil, with ends of foil extending over sides; spray with cooking spray. Mix cake mix, 1 egg and butter until blended; press onto bottom of prepared pan. Bake 40 min. or until center is almost set; cool 10 min. Use foil handles to transfer dessert to wire rack; cool completely. Meanwhile, beat whipped topping mix, milk and syrup in large bowl with mixer on low speed until blended. Beat on high speed 4 min. or until mixture forms stiff peaks. Refrigerate until ready to use. Prepare using JELL-O Vanilla Flavor Instant Pudding, and blending 1 Tbsp. pumpkin pie spice into the cream cheese mixture before pouring over crust.